LessAccounting software comes with a simple design which assists you at making tiresome and routine accounting work quite easy. 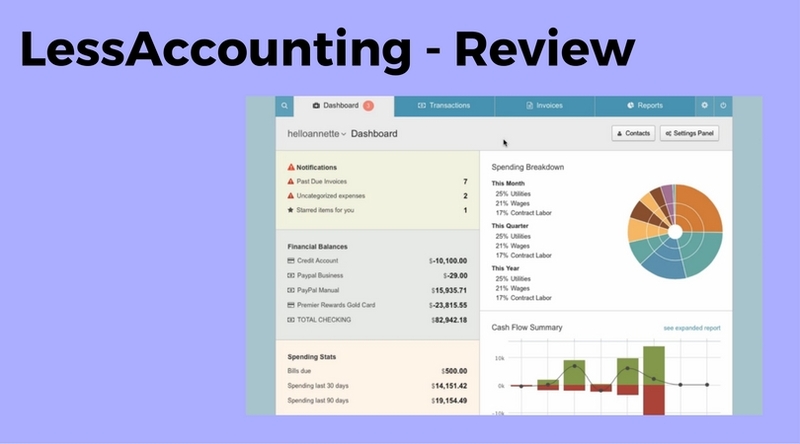 This software realizes that the accounting can be tough especially for small business and that’s the reason which led to the creation of this service which allows the user to deftly handle the accounting tasks. It’s among the few of the best free accounting service present in the market. 1. When you start using this software, it seems quite easy and problem free. Although the process does lack of more options. If you are a first-time user of any bookkeeping software, then you can easily get confused after opening the software as this software doesn’t come with any guide. Along with this, there is no mobile app that can allow you to access your data via your mobile devices. If you need to take a look at your account, then you have to login to mobile device’s browser which can be quite inconvenient. It also doesn’t allow the user to easily track the inventory which can be quite frustrating. 2. It does support routine accounting process such as invoice tracking, expenses, payments, estimates, etc. Generally, doing these tasks within the interface can be quite intuitive and free for any problem, the process still lacks few of the important customization option. However, adding clients and vendors is easy, still, you will face navigational issues, and it can become complicated and filled with confusion quite easily. 3. Although the cloud-based interface also allows you to scroll through the entire process which can be quite cumbersome, especially in case you require, information and you aren’t sure that you haven’t missed anything in case you face an error. 4. This software comes in three different packages, namely, Freelancers, Small Businesses and Big Businesses. These packages are different in composition and features, segregated according to the budget of the business user. One can easily upgrade to better package in case there is any such requirement. 5. It comes with email and telephonic support. The service is quite quick and sufficient enough to resolve your issues. However, this software doesn’t come with any user community which means you can’t get hold of other users using this software for their own respective businesses. 1. It allows the user to create customized accounting workflows that result in saving time. 1. It doesn’t provide the ability to track and also manage the inventory via its interface. When it comes to bookkeeping, this software takes away all the pain. It’s a lightweight software but still provides plenty of features. It also allows you to get paid on time. So, if you are looking for budget friendly accounting software with a chance of probable upgradations in the future, then this software is perfect for you. In case you use this software, then do let us know about your experiences in the comment section below.